The Dunin-Deshpande Queens Innovation Centre encourages, enables and supports innovation activities of students, professors, entrepreneurs and Canadian companies and helps drive innovation and entrepreneurship across the region. The mission of the Dunin-Deshpande Queens Innovation Centre is to encourage, enable and support the innovation activities of students, professors, entrepreneurs and Canadian companies through incubators, accelerators, joint courses, workshops, internship opportunities, seminar series, conferences and pitch competitions. It is a pan university initiative enabled through the Office of the Provost‎ and strong continuing support from its founding faculties. It was established in 2012 by the Faculty of Engineering and Applied Science and the Smith School of Business. 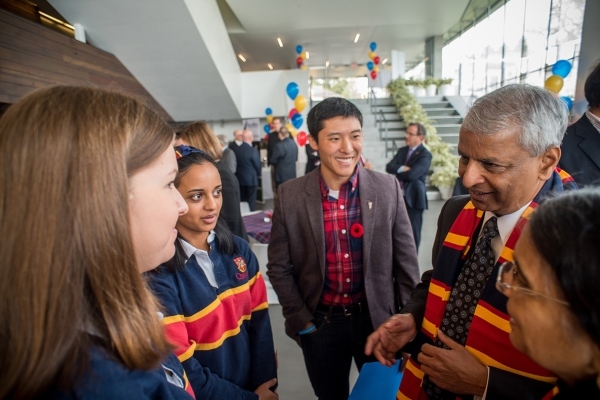 Led by Queen’s award-winning faculty together with some of the world’s best innovators, policy makers, and legal and business strategists, the Dunin-Deshpande Queens Innovation Centre challenges students across all faculties to combine their knowledge and skills to bring innovative ideas, inventions and products to market and launch social initiatives for the benefit of our University, our community and our world. You can read more about the centre at http://queensu.ca/innovationconnector. Dupuis Hall, 19 Division St.